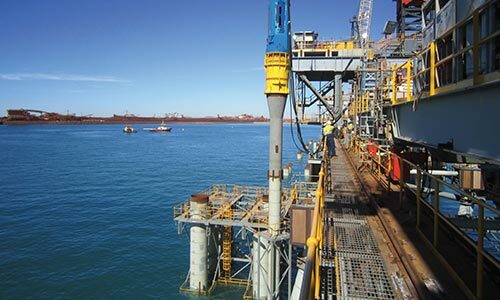 The Cape Lambert Port B project comprises two stages which increase Rio Tinto Iron Ore’s export capability by 100MT/annum. The jetty and wharf piles are highly loaded, and depending on location and geotechnical conditions, either compression, tension or lateral loading may govern pile acceptance. After difficulties in the execution of Phase A, FSG were engaged by Rio Tinto to carry out a design review and implement pile verification processes to expedite pile sign off for critical path piling works. Extensive geotechnical exploration along the alignment of the 1.8km wharf shows significant variations, including claystones, variably weathered basalts, and occasional bands of high strength chert and silicieous calcarenite. The primary challenge for the project was to develop fast and reliable methods of pile acceptance and sign-off which did not delay critical path piling works in highly variable ground conditions. The project comprised approximately 500 steel tube piles varying from 1200mm to 1700mm diameter. Piles were driven with Junttan® 25-tonne and 28-tonne ram-weight hydraulic hammers. FSG provided expert advice during Phase A of the works, when considerable difficulties were experienced with interpretation of PDA testing results and achieving sign-off for both tested and untested piles. For Phase B of the works, FSG were engaged by Rio Tinto to carry out geotechnical review, pile design, testing and verification services. 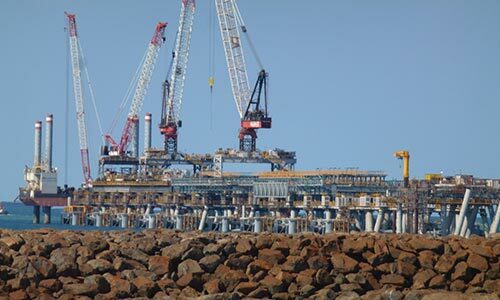 This resulted in a rationalised PDA testing program and the development of a detailed automated process of verifying axial and lateral capacities in real time during pile installation. This process enabled clear piling targets to be issued prior to installation of each pile, and pile sign-off immediately upon completion of driving the majority of piles, which allowed the works to progress without delay. Through the introduction of robust procedures and the application of innovative techniques to correlate PDA test data with real time driving information, FSG were able to provide rapid assessment of pile lateral, tension and compression capacity. This allowed the contractor to proceed with piling works without delay and resulted in considerable productivity gains.